Fenerbahce have protested to Uefa after Shakhtar Donetsk played Brazil midfielder Fred against them, despite facing doping allegations. European football’s governing body has confirmed it is investigating Tuesday’s Champions League third qualifying round first-leg tie, which finished 0-0. Fred, 22, tested positive for a banned diuretic at the recent Copa America in Chile, reports in Brazil alleged. Shakhtar coach Mircea Lucescu admitted Uefa had advised him not to play Fred. The player faces a ban should a second sample confirm the reported findings of the first test. “Before the game, Uefa advised us not to include him but we had not received any official documents and this was just a verbal recommendation,” Lucescu said. Shakhtar host Fenerbahce in the second leg of their tie on 5 August with the winners advancing to the Champions League play-off round for a place in the group stage. 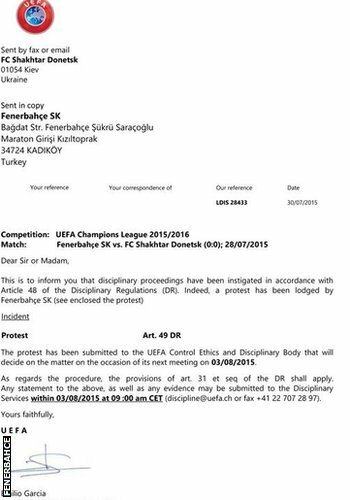 Uefa’ s control, ethics and disciplinary body will decide the outcome of the protest on 3 August. Called up for the injured Luiz Gustavo, Fred played in Brazil’s opening two fixtures at the Copa America but was dropped for the final group game against Venezuela and quarter-final defeat by Paraguay.